A new method of isotope geochronology was proposed for dating native platinum minerals on the basis of the α-decay of the natural isotope 190Pt. The analysis of the thermal desorption of helium in the crystal lattice of native metals, including platinum, allowed us to predict a very high thermal stability (retentivity) of radiogenic 4He in native platinum minerals up to their melting temperatures. In order to validate the proposed 190Pt-4He method, direct isotopic dating was performed for isoferroplatinum from the Galmoenan dunite-clinopyroxenite and Kondyor alkaline ultramafic massifs. The results of dating obtained by this method for primary ore platinum from the Galmoenan Massif (70 ± 5 Ma) are consistent with geological observations and mean Sm-Nd and Rb-Sr isotopic age estimates. The 190Pt-4He age obtained for placer isoferroplatinum from the Kondyor Massif (112 ± 7 Ma) also agrees with geological observations and is close to the K-Ar and Rb-Sr ages of koswites (phlogopite-magnetite pyroxenites, gabbros, nepheline syenites, and metasomatic rocks after dunites). Our experimental data demonstrated that the 190Pt-4He method is a promising tool for dating native platinum minerals. Original Russian Text © Yu.A. Shukolyukov, O.V. Yakubovich, A.G. Mochalov, A.B. Kotov, E.B. Sal’nikova, S.Z. Yakovleva, S.I. Korneev, B.M. Gorokhovskii, 2012, published in Petrologiya, 2012, Vol. 20, No. 6, pp. 545–559. 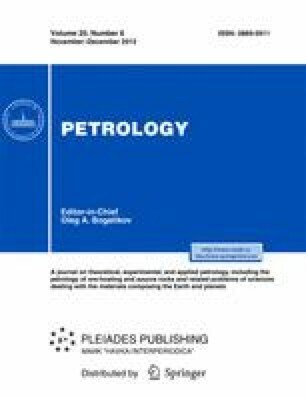 Coggon, Ju., An Application of the 190 Pt- 18 6Os Isotope Decay System to Dating Platinum-Group Minerals: Doctoral Thesis, Duham University, 2010. http://theses.dur.ac.uk/398/. Gruppa Analitikov po Izucheniyu Rynkov Metallov (Group of Analysts on Studying Metal Market), METAL Research International Metallurgical Research Group//www.metal-research.ru 2011.